Champion Automobilwerke GmbH was a German producer of small cars, initially manufacturing in Paderborn. The cars were produced and sold by a succession of businesses between 1952 and 1958. At the outset the cars were impressively simple and inexpensive, but as they became slightly less simple they also lost much of their price advantage. 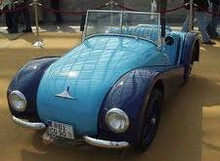 As larger manufacturers moved centre stage in the German auto-market, the producers of the Champion failed to achieve the volumes necessary to justify the investment needed to develop and produce the cars: the brief story of the marque is of a succession of financial crises and failures. The car originally developed by ZF of Friedrichshafen was a two seater with a single cylinder 200 cc rear-mounted two-stroke lawnmower engine supported by a supercharger. Power was delivered to the wheels via a three speed gear box: despite the low weight of the car, there was also a reverse gear. The first prototype was actually built further to the south at Herrlingen near Ulm in 1948. 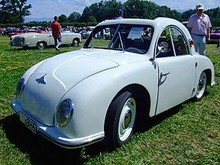 The car was based around a central steel frame and employed a rear mounted engine, being clearly inspired by the Volkswagen lay-out, but smaller and simpler having regard to the availability of production facilities and materials in the late 1940s. In 1949 a former BMW engineer then known for his work on early post-war racing cars and named Hermann Holbein acquired the production rights for the car. One year later, Holbein introduced the Champion, which would be assembled at the newly created Champion Automobilwerken plant in Paderborn until 1952. In 1952 production was taken over by the Ludwigshafen based "Rheinische Automobilfabrik Hennhöfer & Co" company. When this business went into liquidation a Dane named Henning Thorndahl took charge of assembling the vehicles until October 1954 when the last car was produced. In 1955 production was taken over by Maico, a firm then as subsequently better known for its motor cycles.